NAT will be a thing of the past. NAT is also a hinderance to progression. IPv6 was designed with route aggregation/summarisation in mind. DHCP is still available, but IPv6 nodes can assign themselves an address without the help of a DHCP server via autoconfiguration. QoS capabilities with IPv6 are far greater, due to many more values within the IPv6 header. version – This is set to “6” in IPv6. traffic class – In IPv4, this was the Type Of Service (TOS) field. The “traffic class” name comes from this field’s ability to allow us to assign levels of importance to a packet via QoS. 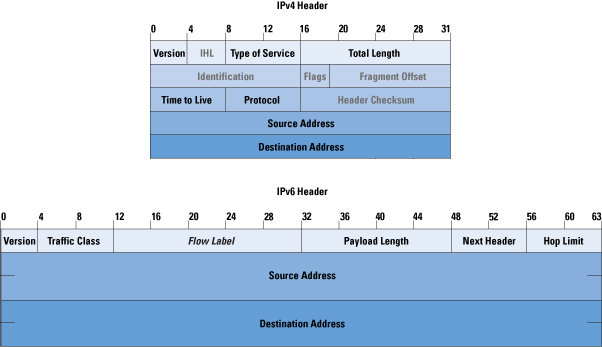 flow label – No equivalent in IPv4, this field allows a packet to be labeled as part of a particular flow. This also helps with QoS, allowing us to prioritize traffic flows rather than individual packets. hop limit – Roughly equivalent to IPv4’s Time To Live (TTL) field. Every hop decrements this counter by one, and when that counter hits zero — the “time to live” becomes the time to be discarded. source address, destination address – they’re now 128 bits. With IPv6, our non-compressed address has eight sections of four hex values, separated by a total of seven colons. If you have consecutive fields of zeroes, they can be expressed with two colons. The key rule: you can only do this zero compression once in an IPv6 address. Leading zeroes in any 16-bit field can be dropped, but each block you do this with must have at least one number remaining. If the block is all zeroes, you have to leave one zero. This is leading zero compression. Zero compression: Allowed only once per address. Leading zero compression: Perform as often as you like in an address. Every interface on a given IPv6 link has to have a unique identifier, and once again the name is the recipe with these interface identifiers. This value will always be 64 bits in length, and in the case of an Ethernet interface, the identifier is dynamically created from the MAC address of the interface. To make this up to 64-bits, we need to add something.. The hex value “FFFE” is inserted directly in the middle of the MAC address, right between the OUI and the vendor code. Example with unique identifier: 00-01-02-FF-FE-aa-bb-cc. This is the eighth bit in the 1st octet which defines wether this is a unicast or multicast based address.